Kicking off at 6:30pm, NBA and soccer greats gathered to compete at Sara D. Roosevelt Park on the Lower East Side (at Forsyth and Stanton Streets). Showdown featured professional soccer players and NBA stars in a soccer friendly/competitive exhibition to benefit the Steve Nash Foundation’s programs for underserved children. NBA announcer Spero Dedes called the match with live, on-field commentating. Coaching the team captained by Steve Nash, actors Jason Sudeikis and Brendan Hunt made their Showdown debuts, reprising their roles as Coach Ted Lasso and Assistant Coach Beard from the wildly popular NBC Sports ads (the spots featured Sudeikis as an American football coach ignorantly attempting to coach soccer in the British Premiere League, with Hunt as his soccer-versed assistant trying to educate him on the beautiful game; in them, Lasso is ultimately fired by Spurs, only to be picked up as a pundit for NBC Sports). After spending the afternoon with the players, the duo could be seen walking the lower east side with the athletes, who’s impromptu parade was joined by NBA star CJ McCollum en route to Showdown. 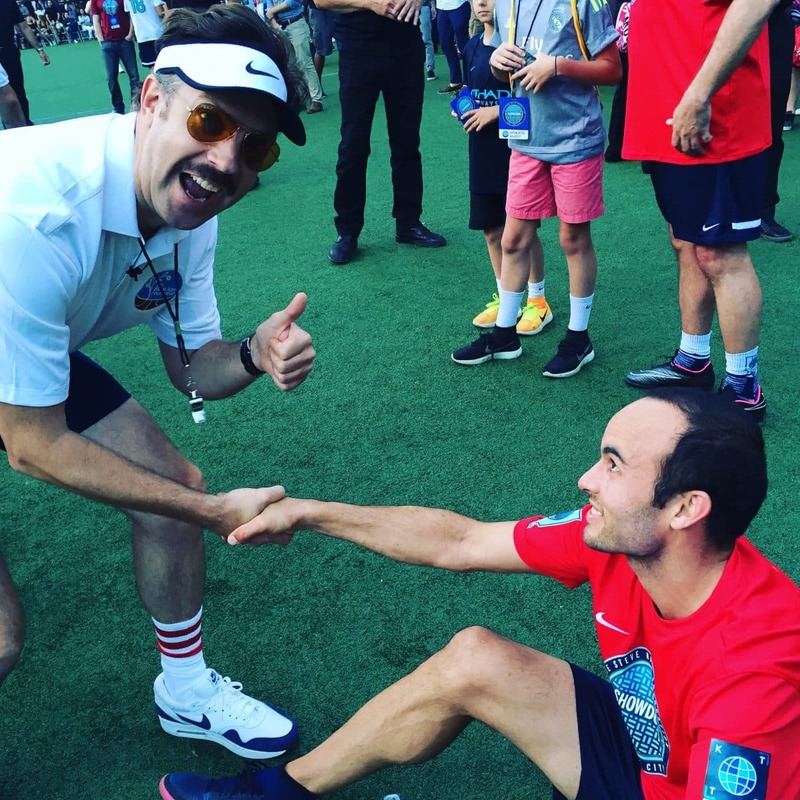 Showcasing what appeared to be no new knowledge of the sport, Coach Lasso nonetheless boisterously provided tips and tricks to his team, leading them to a 11-5 victory over captain Landon Donovan’s well-appointed Showdown roster. NBA Playoffs standout Bismack Biyombo scored four goals to solidify the hard work and time Coach Lasso put in to support his players, and goalie Asmir Begović was awarded the game’s TAG Heuer Showdown MVP award. Giuseppe Rossi, Rondae Hollis-Jefferson and Donovan kept their team alive with four goals, but it wasn’t enough to clench the win. NBA MVP Kevin Durant was on-hand to support the Showdown athletes, meet with wildly excited fans, and take in the match. Prior to the match, the David Villa DV7 Soccer Academy delivered a youth soccer clinic attended by DV7 athletes and youth from Street Soccer USA, with a post-practice meal provided by Subway. At the same time as the Clinic, for the second year, the GNC Live Well FanFest opened to Showdown guests and downtown visitors, with exciting innovative and interactive fan opportunities presented by sponsors throughout the evening. GNC Live Well also provided attendees with tools to keep healthy at the event, and GNC educators were on hand to help attendees with product questions and support. At the beginning of the game, Steve joined TAG Heuer to present Landon Donovan with the Spirit of Showdown Award, recognizing his outstanding career and great contribution to the sport of soccer. After the match, Asmir Begović was unanimously awarded the TAG Heuer Don’t Crack Under Pressure Most Valuable Player Award. Both men received a TAG Heuer Connect Smartwatch. During halftime, Steve Nash and Giuseppe Rossi worked together during the Don’t Crack Under Pressure juggling contest, raising an additional $10,000 for the Steve Nash Foundation by juggling continually between themselves for more than five minutes – they could have kept going, too, if we didn’t need to get the second half underway. In its ninth year, Showdown highlighted fancy footwork and great assists made both on and off the pitch, with all players suited up in Nike gear and shoes, and jerseys designed in collaboration with Kicks To The Pitch and Uni-Sport LA. The official Showdown t-shirt is for sale at stevenash.org/assist; Showdown T-Motes and limited jerseys will be on sale in the Steve Nash Foundation’s Make An Assist store shortly. 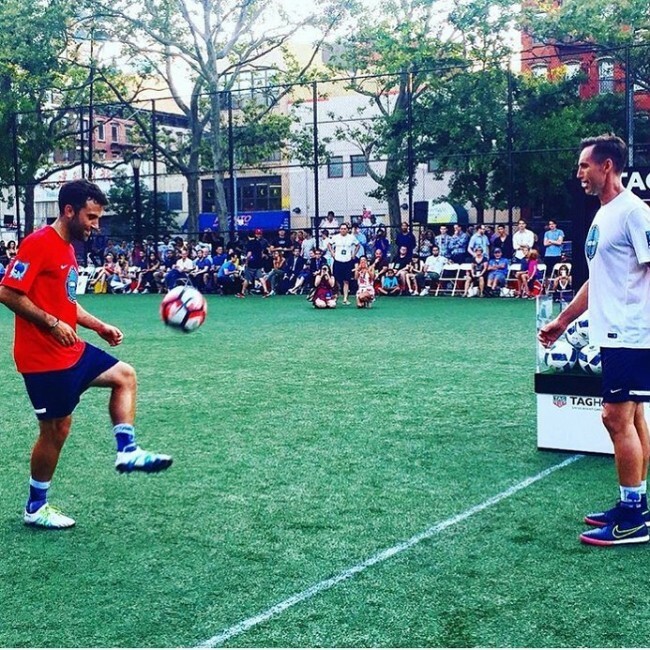 This year’s Showdown was sponsored by GNC, Nike, Jawbone ®, TAG Heuer, Kicks To The Pitch, Uni-Sport, NYCFC, NBA Cares, Phebe’s Tavern & Grill, and Guinness, with support from Major League Soccer, Titan Tea, Tabl’eau, Cartel Coffee Lab, KICK, Legends Sock Co., and MISSION Athletecare. Team White: Steve Nash (two-time NBA MVP), Simone Sandri (Showdown Co-Founder), Kyle Martino (retired MLS and US Soccer), Massimo Gobbi (A.C. Parma), Asmir Begović (Chelsea), Salomon Kalou (Hertha BSC), Bismack Biyombo (Toronto Raptors), and Francesco Valiani (retired Italian soccer star). Team Red: Landon Donovan (six time MLS Cup winner and US Soccer captain), Giuseppe Rossi (Levante), Georgios Samaras (Rayo OKC and Greece national team), Heath Pearce (former American soccer player), Rondae Hollis-Jefferson (Brooklyn Nets), Jeff Matteo (Assistant Coach, St. John’s Basketball and retired US Soccer player), Chris Mullin (NBA Hall of Famer & Head Coach of St. John’s Basketball), Marc Stein (ESPN’s Soccer Today), and Mike Quarino. 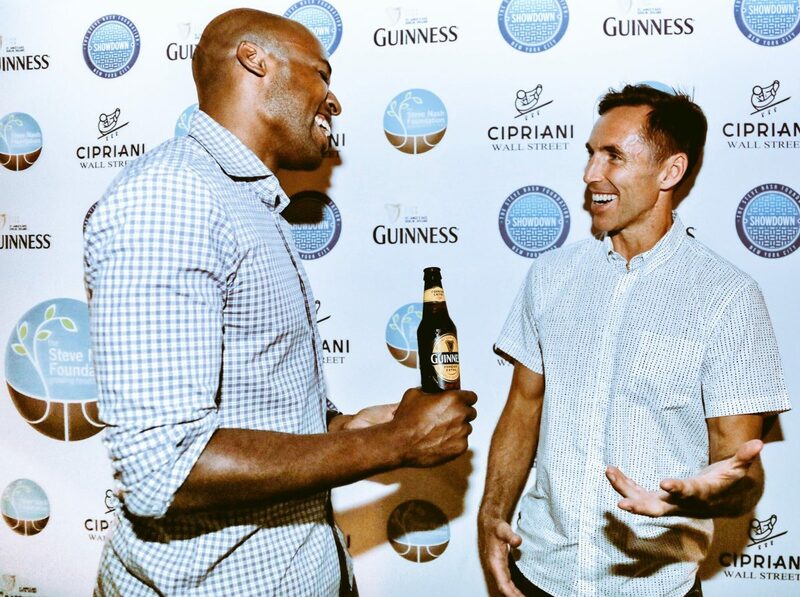 Following the game, players joined with one another for a team dinner hosted by the Penny Farthing, followed by an intimate After Hours party at Cipriani Wall Street hosted by Guinness and Guinness USA. 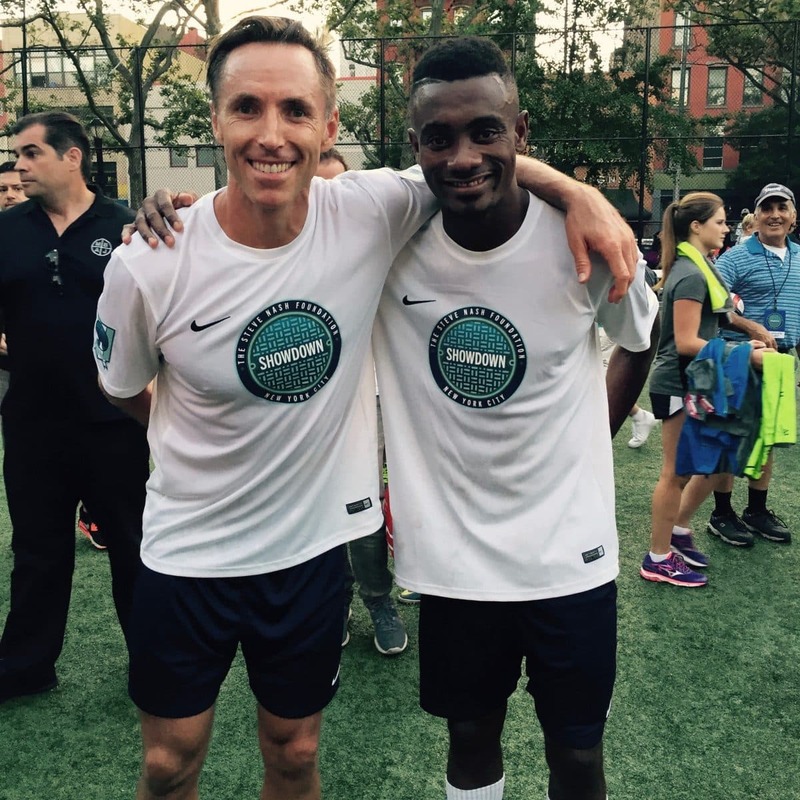 Follow on Twitter & Instagram @SteveNashFdn with #ShowdownNY, or visit SteveNash.org/Showdown for photos, recaps, and more information, and we’ll be seeing you on the pitch!